High Efficiency Gas Furnaces--Save Money: What Is The Most Economical Fuel For Home Heating? What Is The Most Economical Fuel For Home Heating? When your old furnace has reached the point where you obviously must replace it very soon the question arises as to which fuel is going to be best, and cost the least for heating your home. Most consumers find that natural gas is the least costly fuel to use for home heating, but there are some questions which may arise before making a final decision. In years past electricity was always the most expensive home heating method. Oil heat cost less, and natural gas was always the lowest cost fuel. That is no longer always the case due to the present high and rising cost of both fuel oil and gas. In addition to this oil and gas prices can fluctuate widely depending on supply questions. Any crisis in the Middle East sparks an immediate rise in prices, and any full scale war in that area would be disastrous for oil suppliers. The gap between costs for these fuels and the cost of electrical heating has narrowed. Note: It is often difficult to isolate the cost per unit of fuel, be it gas or electricity. Include all the costs that relate to the m³ of consumption for gas (for example, gas supply charge, gas delivery charges, gas surcharges). Electric utilities often also have a bewildering range of charges. Apply all the charges except fixed charges (for example, $10/month connection charge). For oil appliances, use an energy content of 38.2 MJ/litre of oil. For electricity, use 3.6 MJ/kWh and 100-per-cent efficiency. Note: 80 GJ (or 80 gigajoules) is the energy required for heating the example house over the winter (heat load). Your own house will likely be different. However, the relative costs calculated for alternative fuels and furnaces in the example house should help you make a selection for your house. The above material is quoted directly from the CMHC website. This calculation can be performed to find the present day figures for heating your home by various methods. By substituting higher prices for fuels in the future the cost of heating your home under various scenarios can be calculated. 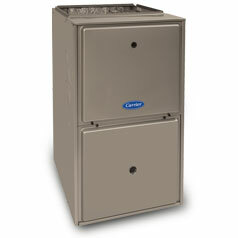 For more information check out gas furnaces prices and high efficiency furnaces. Thanks for sharing. I really enjoyed the video. We have a rheem gas furnace and its great.